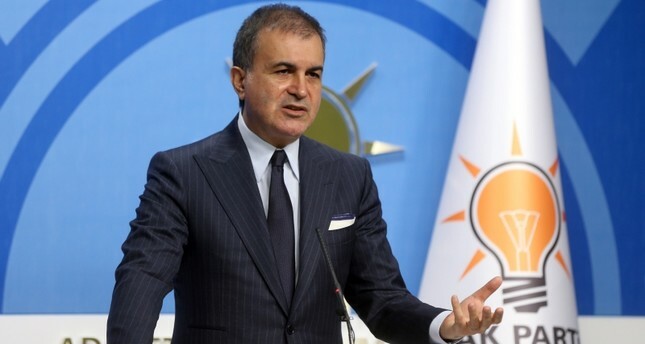 A committee of Turkish officials, including the Turkish foreign and defense ministers and the head of Turkish intelligence, will pay a visit to Russia on Saturday, Dec. 29 to discuss the latest developments in Syria, AK Party spokesman Ömer Çelik said Wednesday. Foreign Minister Mevlüt Çavuşoğlu, Defense Minister Hulusi Akar, Presidential Spokesperson İbrahim Kalın and National Intelligence Organization (MIT)'s chief Hakan Fidan will be among the officials visiting Moscow, Çelik said. A Turkish committee will also pay a visit to Washington soon, the spokesman said, adding that U.S. National Security Adviser John Bolton is scheduled to come to Turkey after New Year's in early January. Çlik also slammed Ayelet Shaked, Israel's justice minister, for her remarks against President Recep Tayyip Erdoğan over Turkey's planned anti-terror operation in Syria, saying she lacked the standing to criticize Erdoğan. On Sunday The Jerusalem Post quoted Shaked as saying: "I hope that they [Kurds] will win in their battle against the Turks. I hope that the international community will prevent Erdoüan from massacring the Kurds." Shaked was referring to Turkey's planned counter-terror operation against PYD/YPG terrorists in the region east of the Euphrates River in Syria. The PYD/YPG terrorizes Arabs and ethnic Turkmen as well as Kurds in the region, according to Turkish officials. Since 2016, Ankara has carried out two similar counter-terror military operations in northern Syria. Erdoğan had said Tuesday that he would have a face-to-face meeting with his Russian counterpart Vladimir Putin regarding the U.S. withdrawal from Syria, saying "The U.S. did its part" by announcing their pullout. On Wednesday, Washington announced it will be withdrawing all of its troops from Syria, following a conversation between Erdoğan and U.S. Trump over an imminent Turkish cross-border operation to eliminate PKK-affiliated People's Protection Units (YPG) terror group from northern Syria. It has been reported that the U.S. still has about 2,000 troops in Syria, many of whom are working in close cooperation with the YPG-dominated Syrian Democratic Forces (SDF). Following Trump's move, Erdoğan said Friday that Turkey had decided to postpone its cross-border operation into areas controlled by the YPG in eastern Syria for some time.